It’s a brave new world at New World. - Bags Not - Say 'Bags Not' to single-use plastic bags. It’s a brave new world at New World. In 2017, the New World supermarket chain asked customers about single-use plastic bags with their Bag Vote poll. Shoppers were clear that they wanted to see them gone for good. 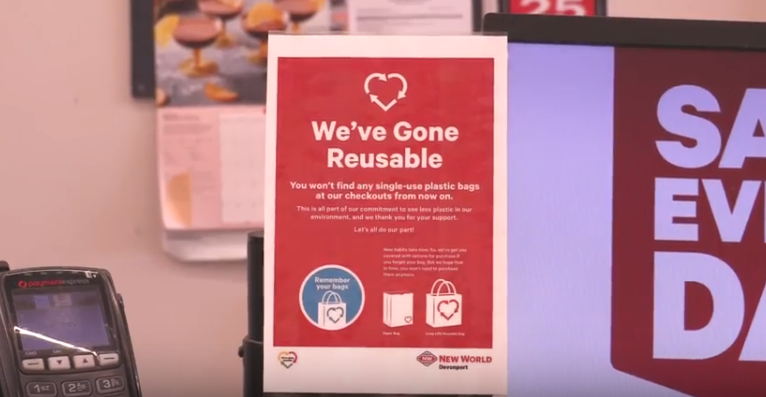 In 2018, New World furthered their commitment to eliminating plastic bags by becoming a principal partner with “Bags Not”. So it’s no surprise to see New World still leading the way. As of August 1, their Devonport supermarket became 100% plastic bag free at the checkouts. Customers in this seaside Auckland community have been strong supporters of reusable bags, making the move a smooth one and showing the rest of us how simple it is to make the change. On August 29, New World supermarkets in Howick and Marton also joined Devonport as early adopters of this new way of shopping. And from 1 January 2019, every New World around the country will be 100% plastic bag free at their checkouts. Chaoooo! !